When I look at my overall repertoire of recipes that I like to cook, and also like to eat, it feels as though I am a little meat heavy. I’ll probably always be a little meat heavy, it works for me, but at the same time I recognize that I need to be increasing the number of veggie sides that I am comfortable making, and that are tasty enough that my family and I will actually enjoy eating them! 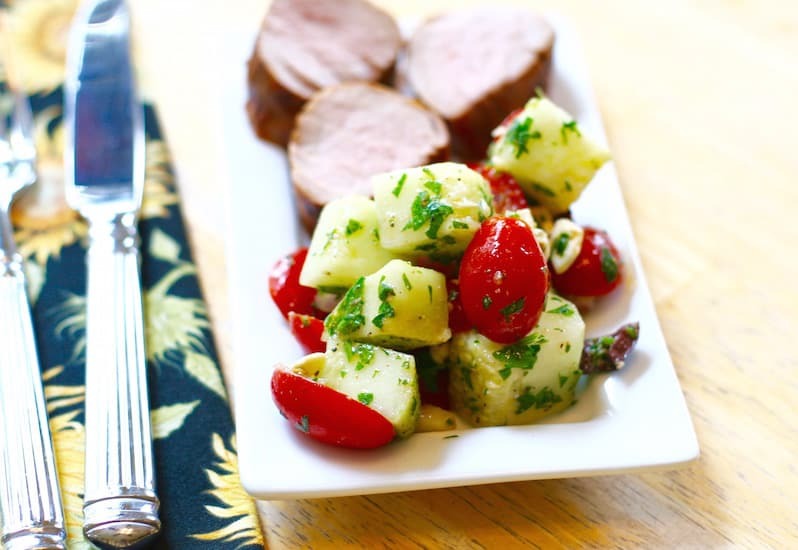 And now that it’s summer, why not find a new recipe that takes advantage of fresh produce that I can find at a local farmer’s market or maybe even in a neighbor’s back yard? 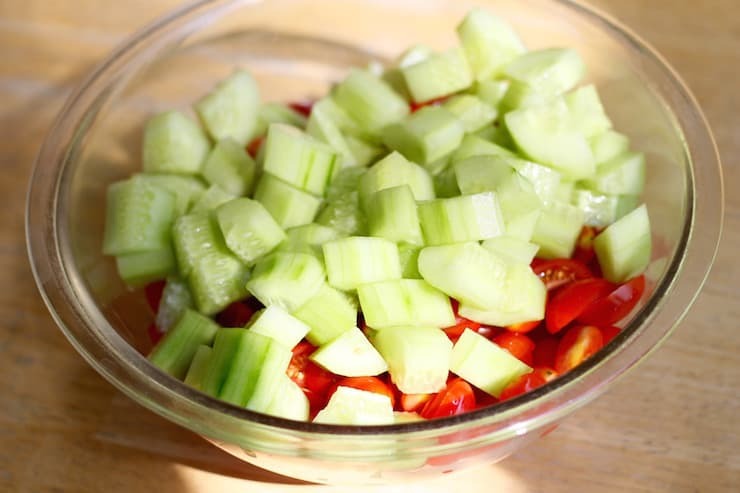 I’ve always liked fresh tomatoes, with a pinch of salt, and salty cucumbers work for me as well. 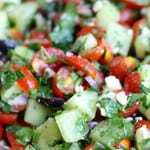 Perhaps it’s time to find a tomato cucumber salad that is quick, easy, nutritious, and above all else, nice to eat. 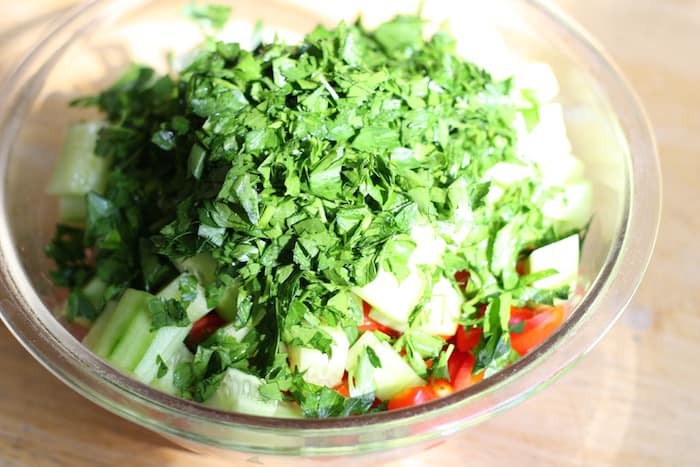 Not too much thinking goes into this recipe, simply gather up the freshest and tastiest ingredients you can find, chop them all up and you are about done. If I am buying the ingredients at a store, I’ll naturally look for organic first, to reduce my family’s exposure to pesticides. But if I am at a farmer’s market, or grabbing ingredients out of a local garden, I’m not as concerned about the organic labeling and feel comfortable using whatever I can get my hands on. I’m also not very concerned about exact measurements here. I’ve never measured out the olives or goat cheese using a scale or measuring cup at home. For instance, with the goat cheese, I usually grab a container of crumbles from the store, and use about half of it, no need to scoop it out or get my kitchen scale all worked up. I might be an ounce high or low, but I’m ok with that, it seems to be a pretty good trade off considering the ease of throwing this recipe together without having to worry about exact weights to the gram. One side note, which will affect the taste, nutrition and prep time of this recipe… chopped avocado makes a pretty awesome addition! My kids haven’t developed their father’s love of olives, so when I’m being generous to their “needs”, I consider dumping the olives and adding in chopped avocado. But eat up quickly, after a day or so, the avocado pieces really start to brown and look unappetizing. The original recipe that I included on this page was produced a much smaller batch, but I found that I was consistently doubling the recipe, because it’s great for crowds or get-togethers, but it’s also pretty decent the next day or two, and I’d rather just make it once and coast on by for a few days! Feel free to cut the amounts in half, or double, or whatever makes you happy, I’m pretty sure that the freshness of the ingredients count for more than getting the ratios exactly right. Once again I feel compelled to add a disclaimer of sorts when providing a nutrition panel for a recipe. Without measuring by grams, there is almost no way to make sure that everyone is using exactly the same amount of each ingredient. For instance, when the recipe calls for 1 large cucumber, how large is large? And when looking at 1/2 cup olives, how small did you dice your olive pieces into? That will make a bit of difference in the calculations. 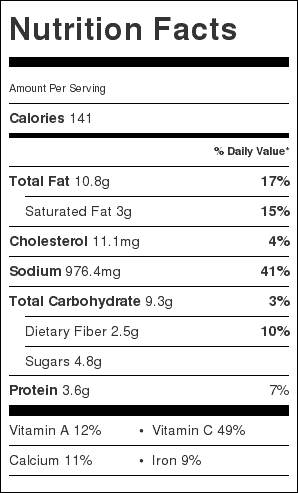 But the biggest determinant here is simply how many servings do you think this recipe will make? I don’t know. 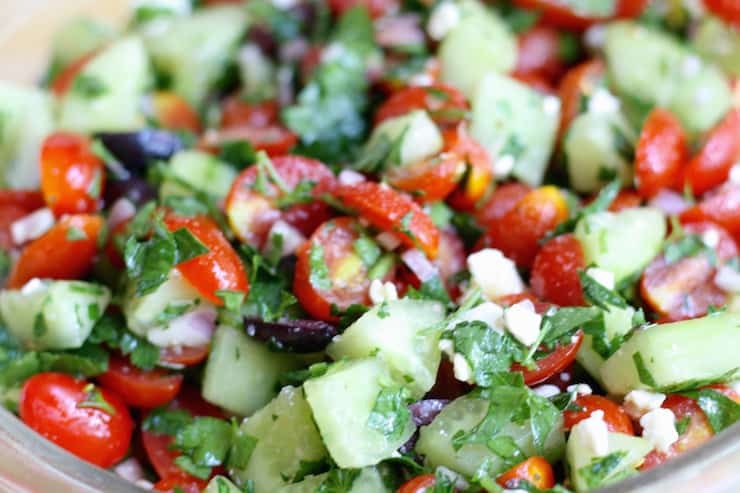 Do you like this recipe and think you’ll eat a ton of tomato cucumber salad in one sitting? Then you probably won’t get as many servings as I did. So to make it easy, I just picked a number out of thin air, and calculated this recipe to produce twelve servings, which is what the panel below estimates.